I’ve long wondered why no one has opened a modern Mexican restaurant around here. Taco nights at the various local eateries are always packed, and I’ve actually begged a few chefs to open a cantina! Not that I’ll take any credit for chef Colt Taylor’s new direction at The Essex, but I’m very glad about it! Gone is the recent pizza and meatball menu, replaced by interesting and well-priced tacos, a card of intriguing variations on margaritas and other tequila or mezcal-based potions, plus flights of Casamigo’s, George Clooney’s famous brand. 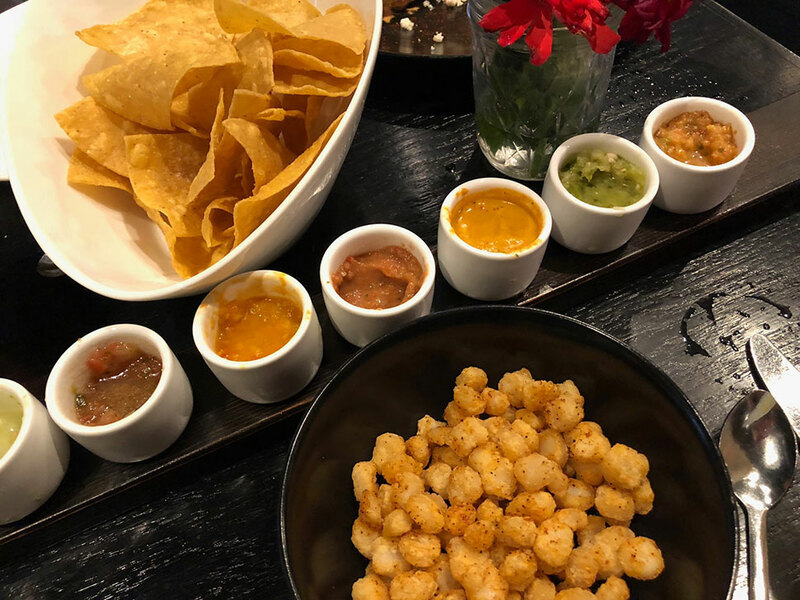 And, of course, everything is created in-house, from the blue and white heritage corn tortillas to the eight tastings of salsa that arrive with your hot chips. You’ll find no gloppy enchiladas and blah rice and beans here. 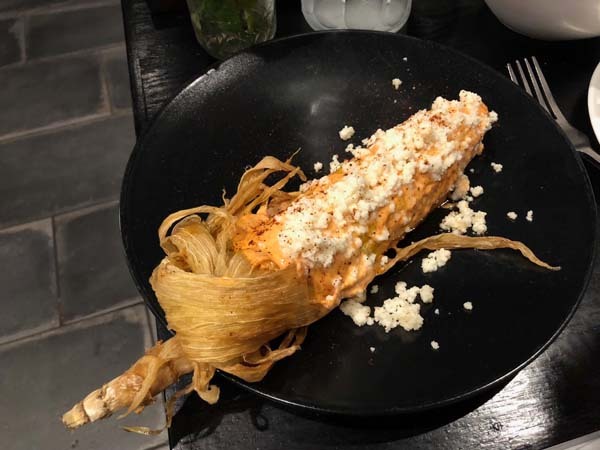 We, of course, overdid it: The street corn is delish but a bit messy to eat in public, the queso on the salty side, but the tacos were the star! 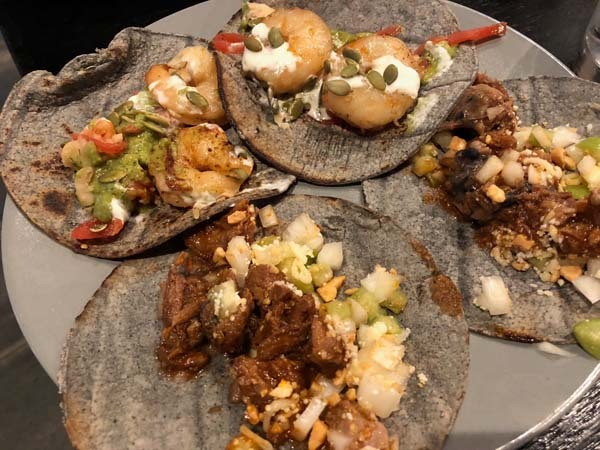 At either $10, $12 or $14 for two good-sized portions, we supped happily on Garlic Shrimp with Queso Fresco and Pepitas, Pork Cheeks in Adobo and Choriqueso, a ground pork and chorizo mixture with pico de gallo and black beans. YUM! (You’ll find plenty of veggie options, too). Definitely order the salsa flight, which runs from mild and tasty Pico de Gallo (moi) to super spicy Salsa Verde (my husband). I noshed happily on tiny fried kernels of hominy (a classic Mexican snack you don’t see around here) and a lovely accompaniment to my fresh and light grapefruit and tequila Paloma. 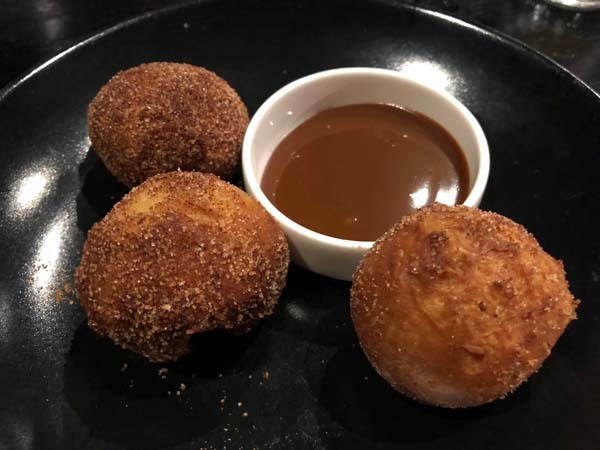 We could not resist Churro Beignets for dessert, and giddily dunked balls of lightly fried dough dusted with cinnamon and sugar in warm melted chocolate. There’s so much more I’d like to try on the menu, so I’ll return pronto for the pork belly, chicken tinga or lobster tacos, ceviche and a slew of sides. The bill was surprisingly small and the room was packed by the time we left at 7:30 pm (I know, we love an early-bird dinner!). 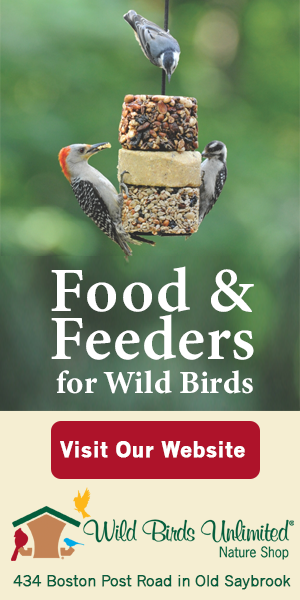 We are HOPING that this concept sticks because as far as I’m concerned, it’s the RIGHT one. Colt has a way with thoughtfully sourced ingredients and he’s got real-deal chef chops. Applying these talents to Mexican makes great sense for the area. Fine dining is Colt’s passion and you’ll find it here, too. He’ll flex those muscles with a separate entrance to the elegant front room at The Essex. This smaller space will be reserved for tasting menus featuring dishes like Ring-Necked Pheasant, Snake River Farms Wagyu Beef, Lobster & Pork Belly Ramen, and more refined plates that are are sustainable and locally sourced. Three course, five course, and seven course Omakase (tasting) menus are offered. 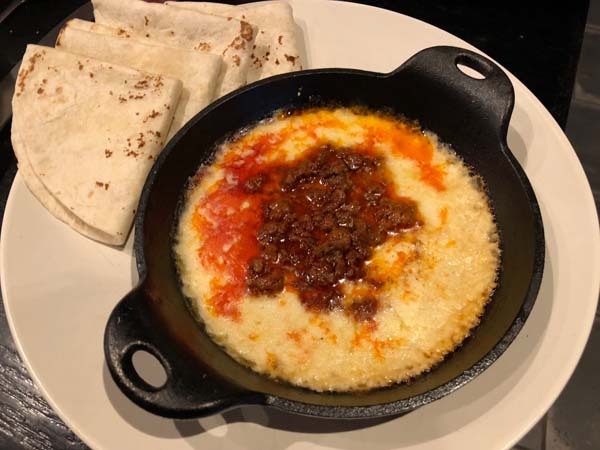 So head to the back door for a chill night of well-priced Mexican food (bring the kids for a $10 children’s menu I’d happily order from) and make reservations for the front room for a taste of Colt’s elevated fare.